Huth Road Elementary School District's Website. 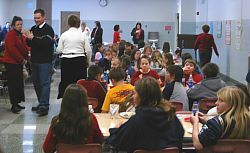 The annual Huth Road Fifth Grade Heritage Luncheon gets bigger and better every year. 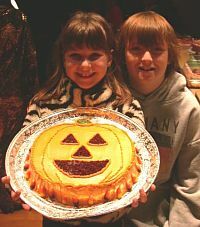 Students' parents are asked to send in food items that are either a tradition in their family or are an example of their ethnic background. Tables were loaded with Italian pasta and pizza dishes, calamari, mac & cheese, venison sausage, chicken fingers, curried lentils and couscous, hummus and pita, Polish and Italian sausage, ham, the list goes on and on. 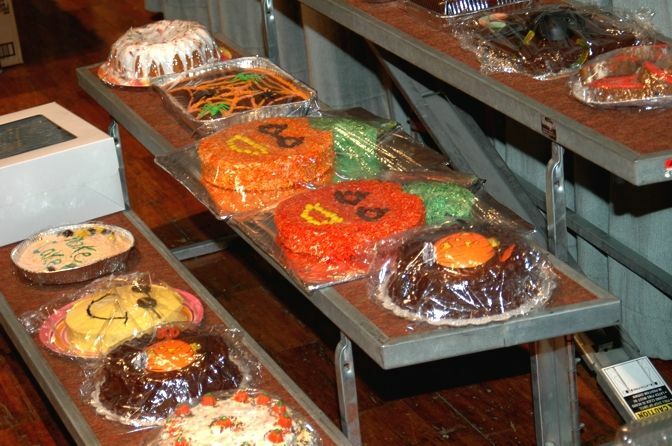 Two tables were filled with desserts of every kind including cookies, candy and cakes. The teachers, especially Mr. Steck! and the students look forward to the luncheons. 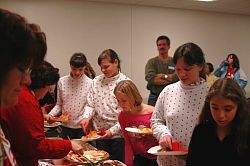 December 21, 2005 . . . .The students in Mrs. Diane Lipp's third grade class at Huth Road School sold frosted cut-out cookies to their fellow students and teachers for an hour each day last week. 1500 cookies were made by Mrs. Lipp's mother, Kathy Smith, and sister, Dory Matwijkow. Parents of the students sent in frosting, sprinkles and bags to wrap the cookies, and the class enjoyed decorating them. 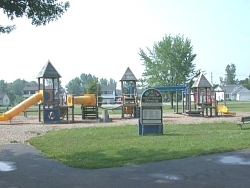 A total of $840.14 was raised to help with the Huth Road playground revitalization plan. Cookie salespeople and their first customer. 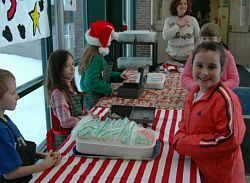 Mrs. Diane Lipp's third grade class at Huth Road Elementary is selling iced cut-out cookies from 10 a.m. to 11 a.m., during the week of December 12-16th. This is the third year for her class to go into the cookie business. 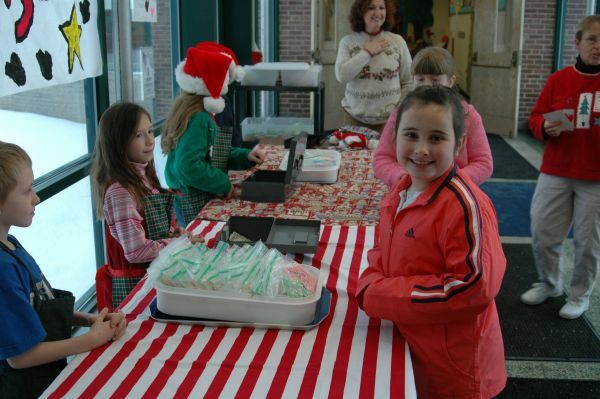 Mrs. Lipp's students enjoy decorating the cookies and selling them. Throughout the week, any student (or teacher) who would like to buy a cookie is allowed to go to the sale. 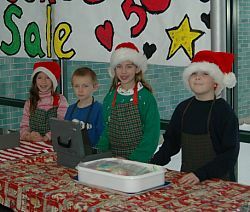 Mrs. Lipp estimates that they have between 1800 and 2000 cookies to sell, made by parents and teachers. The proceeds for the second year will benefit the Huth Road Playground Revitalization plan. Huth Road Boys and Girls Choirs practice for evening performance. 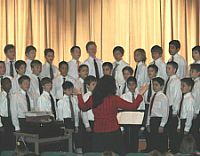 The Boys and Girls Choirs from Huth Road Elementary gave their fellow students a treat on Thursday, December 8, 2005. The choirs sang the selections they will be singing at the Winter Choral Concert in the High School Auditorium in the evening. 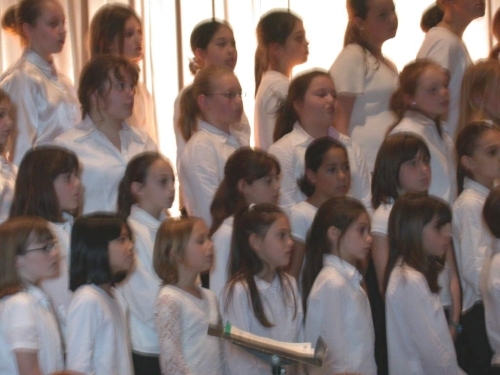 The choirs are made up of 4th & 5th grade students. The boys sang "Innkeeper" and "Big Band Santa." The girls sang "Gloria" and "Who Would Imagine A King" from the movie The Preacher's Wife. Together the boys and girls sang "Simple Gifts." All three groups did a wonderful job! Grand Island Fifth Grade Orchestra tuning up. The Fall Elementary Instrumental Music Concert took place at Huth Road School Wednesday evening, November 16, 2005. 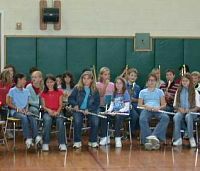 The Grand Island Fifth Grade Orchestra led by Mrs. Kelly Robertson and the Huth Road Fifth Grade Band conducted by Mr. Allan Ripley entertained Huth Road students Wednesday afternoon to warm up. 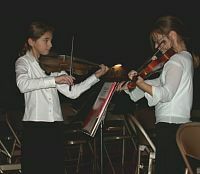 The orchestra is made up of students from Kaegebein and Huth Road schools. Friday night's Huth Road Festival to support the new playground equipment will long be remembered by everyone who came out to have fun and support the Playground Committee's goals. (left) GIHS Jazz Band members; "Cake Walk" cakes! 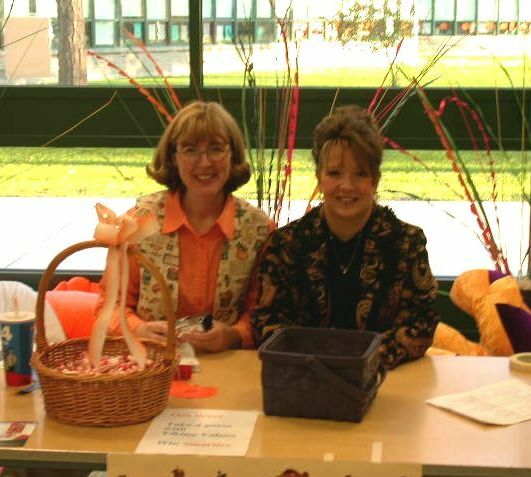 The Fall Festival, sponsored by the Huth Road Playground Committee, was a complete success on Friday, October 28, 2005. Hundreds of students and their families attended and had a wonderful evening. There were crafts in the art room that included painting pumpkins, making foam pumpkin magnets, and decorating trick or treat bags. 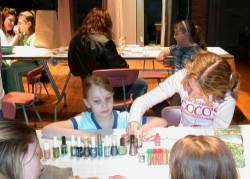 The Grand Island High School Art Club donated their artistic talents to face painting. 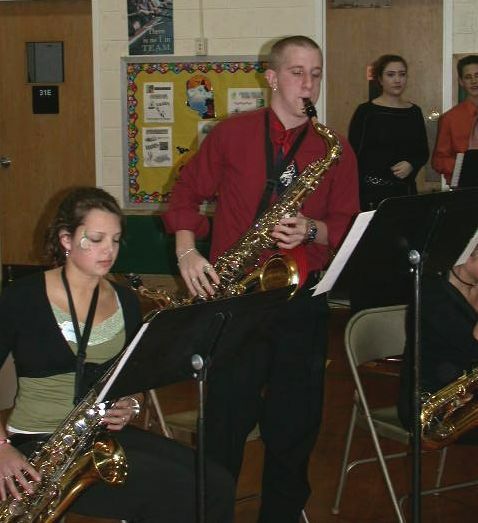 The Grand Island High School Jazz Band entertained everyone in the gym where a basket raffle was held with over 100 baskets. Spooky stories were being told in the circle. 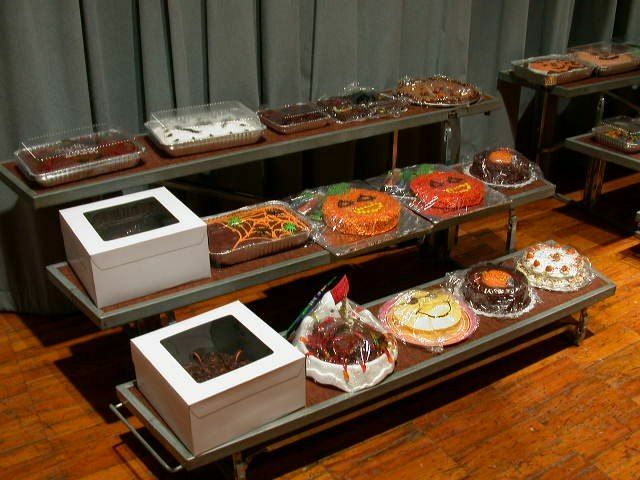 A "Cake Walk" was held on the stage in the auditorium, with over 70 donated cakes being won. Pizza, hot dogs, hamburgers, popcorn, ice cream sundaes, cotton candy and juice were available in the cafeteria, and Buster Bison came by to say hello to everyone. 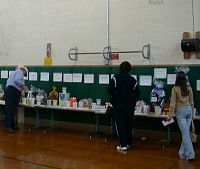 The Fall Fest raised over $6000.00 towards the tearing down and rebuilding of the older part of the Huth Road playground. Chairmen of the event were Barbara Swagler and Diane Lipp. The Univera ensemble perform with student assistance. One hundred and thirteen third graders at Huth Road School participated in Univera Healthcare's youth smoking prevention program, 2Smart 2Start on Wednesday, November 2, 2005. This is the second year the program was presented at Huth Road Elementary and now more than 500 Huth Road students have signed the 2Smart 2Start smoke-free pledge. 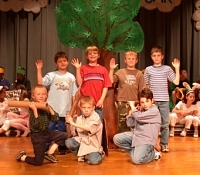 The third graders participated in the interactive theatre performance which includes multi-cultural skits about making healthy choices. The students signed pledge cards promising to live a smoke-free life, and received a coupon book which rewards them with discounts at area merchants. 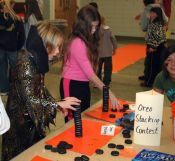 Earlier this fall, 126 fourth graders participated in the 2Smart 2Start program, and 115 fifth grade students participated in "Tar Wars," which is an award-winning educational program designed to increase students' awareness of attitudes about tobacco use and the effects of tobacco on the body. Tar Wars focuses on the promotion strategies of the tobacco industry and teaches students how to examine these strategies, and how these messages influence consumers. 2Smart 2Start was launched by Univera Healthcare's Center for Better Health in March 1999 to reduce smoking prevalence among children. 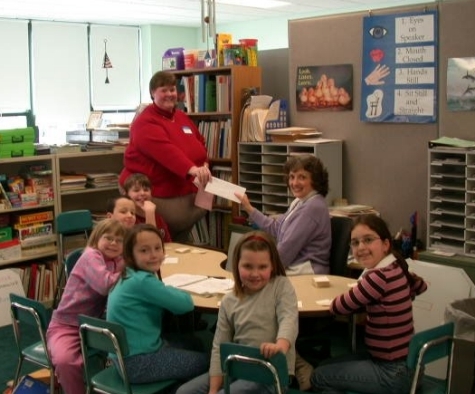 (below) A student is assisted by mother/helper Mrs. Carol Zimmerman. 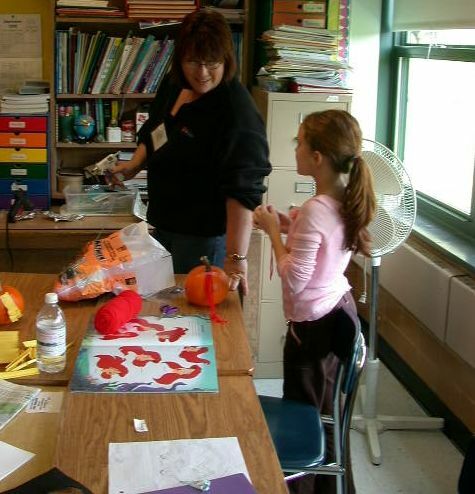 (above) The fifth graders are shown enjoying their pumpkin decorating. 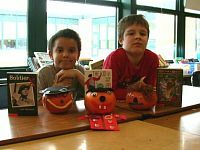 The fifth grade students of Huth Road were each given a pumpkin on Wednesday, October 26, 2005, and asked to decorate it as their favorite literary character. 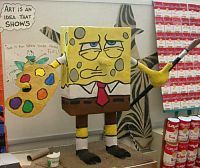 The characters were varied and included Harry Potter and others from the Potter books, Ariel from The Little Mermaid, Scooby Doo, a soldier among many more. The students were very creative with their decorating using marshmallows for teeth, yarn and pencil shavings for hair, buttons, beads etc. The class of Mrs. Tanya Gallagher is shown above decorating their pumpkins. Second grade teacher Mrs. Beth Boron plays guitar as Mrs. Jeanne Percival, also a second grade teacher, displays the words. The second grade students at Huth Road School recently read the book "Round Up At Rio Ranch." 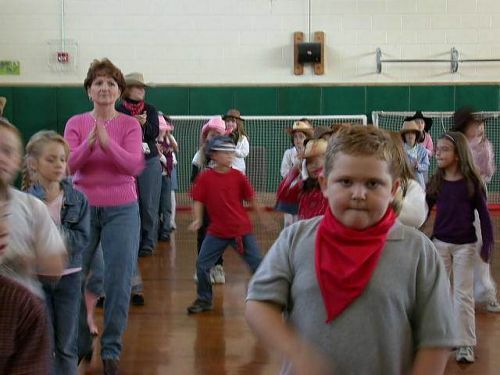 To carry on the theme, a hoedown was held on Friday, October 21, 2005. 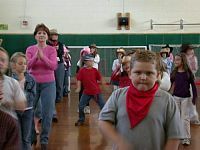 The students and teachers wore their cowboy finery and gathered in the gym to sing songs and dance. 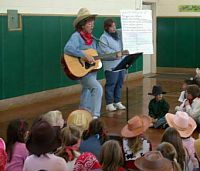 Everyone sang "Home On The Range" and "Coming Round The Mountain" while Mrs. Boron strummed the guitar. Music teacher Mrs. Carol Horrigan brought in the music so the students could dance "The Electric Slide." 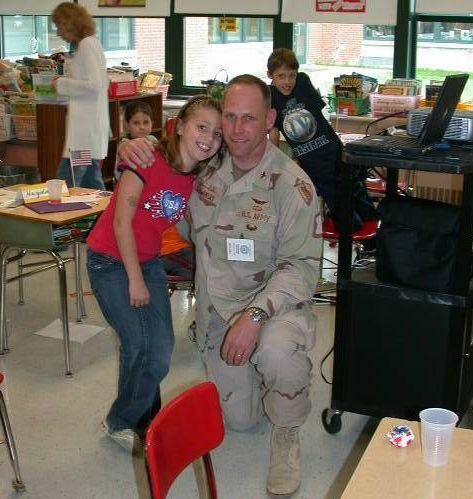 Left: Major Slowinski and daughter Rebecca. Right: Answering student questions. Army Major Mike Slowinski made a special trip to Huth Road School on Wednesday, October 19, 2005 to visit his daughter Rebeccca's third grade class. 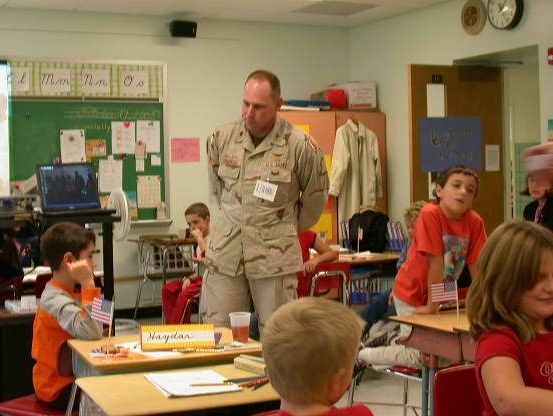 Teacher, Mrs. Deborah Beis, invited Major Slowinski to visit after he returned from a tour in Iraq. The students serenaded the Major with the song, "Thank You For All That You Do," and made cards of appreciation. Major Slowinski showed pictures of Iraq and a video of soldiers visiting schools and passing out backpacks to the Iraqi children. The students in Mrs. Beis's class asked many interesting questions of the Major. Major Slowinski has been in the Army for 21 years since joining when he was seventeen. He will now return to his career as a financial planner for military families and as an ROTC instructor at Niagara University. 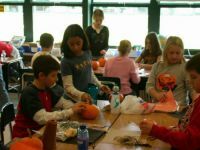 The Huth Road Playground Committee has announced a Harvest Festival to be held from 5-8 p.m. Friday, October 28, 2005 in the Huth Road Elementary School. A fun-filled evening will include activities for everyone, plus food and refreshments, and a huge basket raffle. For full details, click Huth Road Playground Harvest Festival. 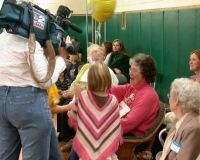 The Huth Road gym was filled with well-wishers. Huth Road Elementary School students, faculty, past and present co-workers and family got together on Friday, October 14, 2005 as a surprise celebration to wish Mrs. Martha Muller a happy retirement as she ends her 34-year career as a lunch lady. 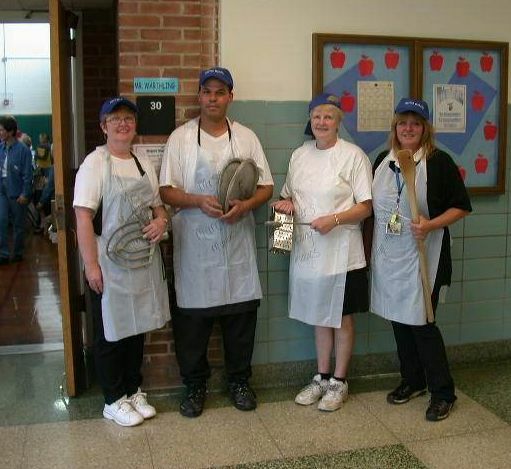 Mrs. Muller, who started as a baker and food service helper at Huth Road School, has been cafeteria manager for the past 25 years. Principal Mrs. Mary Haggarty, in her welcome to Mrs. Muller, gave her a corsage, thanked her for her long years of service, and mentioning that she served over 1.2 million lunches over the years. Mrs. Muller thanked art teacher Mr. Peter Sloan who had eaten the school lunch every day for the many years he has taught at the school. The student band under the direction of Mr. Allan Ripley played "Happy Retirement To You" with the singing help of all the guests. The students sang a song to the tune of "Yes, We Have No Bananas" and the kitchen staff marching squad paraded around the gym clanging pan tops, a grater and a mixer blade with wooden spoons. Music teacher Mrs. Carol Horrigan read a poem that mirrored "Twas The Night Before Christmas," all about Mrs. Muller. Gifts were presented along with a giant card wishing Mrs. Muller well. Huth Road Elementary School PTA officers are: (front left) Diane Lipp (2nd VP), Dorrie Matijkow (Corr. Secretary), Stephanie Kennedy (1st VP), Mary Haggerty (Principal), Kim Tetreault (2nd VP); (back) Cindy Kaiser (Treasurer), Amy McMann (1st VP), Fran Vitello Seaman (Council Delegate), Kathy Belter (President). Not pictured: Julie DeRubis (Rec. Secretary), Mary Egloff (Council Delegate). A Huth Road Playground Committee, made up of parents and friends of Huth Road Elementary School, has been formed to help renovate the Huth Road Playground. 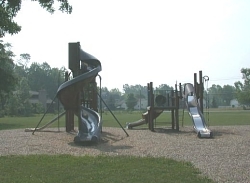 The "newest" of the two-section playground was built in 1995 and the older section was constructed over 27 years ago. It is this section that needs to be replaced. The committee has raised almost $10,000 over the past year and a half through PTA help, school pictures, raffles, freezee pop sales and donations. "We need to raise about $20,000 more in order for the old playground to be removed and a new one be put up in its place," Committee Chair Barbara Swagler said this week. In order to keep the current playground safe, the committee has paid for new wood chips and purchased wood for the current picnic tables. It is the intention of the committee to have the new playground up and running next spring if all goes as planned. 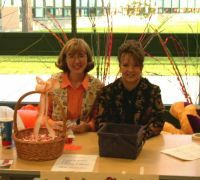 As a means of raising money for this project, a Fall Festival will take place October 28, 2005 at the Huth Road School. "We need your help," the committee reports. A meeting will be held 6:30 p.m. Wednesday, July 27, 2005 at the Huth Road School Playground when all interested parties are urged to attend. Those interested in helping but unable to attend are asked to contact Barbara Swagler, 773-8056. "You do not need to be a Huth Road parent. 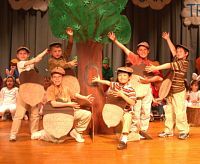 We need all parents who are willing to dedicate a little time to a great project," Mrs. Swagler said . 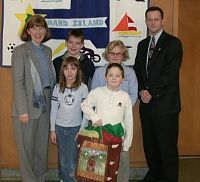 Councilwoman Mary Cooke, teacher Elaine Kasprzyk, students Conor Atkins and Michaela McDonald and Historical Society President Curtis Nestark. Retiring Huth Road teacher, Elaine Kasprzyk, presented $345.00 to Grand Island Historical Society President Curtis Nestark and Town Councilwoman and active Society member Mary Cooke, to help preserve and refurbish River Lea, the historic house on Grand Island where Grover Cleveland vacationed. Huth Road teachers designated River Lea as their "Charity of the Month" for June. 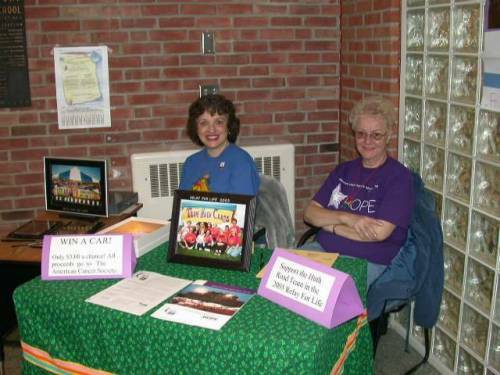 The Huth Road Service Club also conducted a fundraiser to benefit River Lea. Members of the Service Club requested students to donate their change from their lunch to benefit River Lea. Representing the Service Club are Conor Atkins and Michaela McDonald. They presented Mr. Nestark and Mrs. Cooke with a jug full of change totaling $38.49. 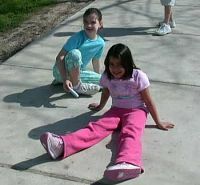 Fourth graders visit River Lea every spring, as part of their study of Grand Island history. Students and teachers alike appreciate all of the volunteers who work at River Lea and keep history alive and well on Grand Island. (Left) Packed gymnasium; (center) Presidential Academic Award Winners; (right) H-pin Award Winners. Huth Road Elementary School held its Moving Up Day ceremony on the morning of Monday, June 20th when 138 fifth grade students were acknowledged for their participation in safety and flag patrol, spelling bee, chorus, band and string ensemble, physical education, art club, service club and the premier Presidential Academic Award and H-Pin Award. The class then sang a beautiful song entitled "The Journey" accompanied by music teacher Mrs. Carol Horrigan. The class gift presented to Principal Mary Haggarty was new a set of plaques for the newly framed portraits of past principals. Presidential Award winners are: Sarah Ramsperger, Megan Karpie, Sarah Stanczyk, Sonia Brar, Sydney Dudish, Alexandra Corrao, Nathalie Winder, Alexandra Seibert, Samantha Kahn, Nicolette Scerra, Gabrielle Ailinger, Danyelle Redmond, Jessica Ungaro, Rebecca Masse, Korey Bennett, Jonathan Goc, Laura Kondziela, Casey Jelonek, Brittney Sonnenberg, Ryan Staines, Eric Bellanca, Alexander Ahne, Taylor Slowinski and Andrew Jasek. H-Pin Award winners are: Nathalie Winder, Danyelle Redmond, Samantha Kahn, Morgan Kaczmarowski, Emma Chambers, Makallie Banker, Alexandra Corrao, Jessica Ungaro, Emily Sommer, Lynne Huffnagle, Sydney Dudish, Megan Karpie, Kenneth Rogoza, Rebecca Masse', Shannon Doctor, Alexandra Seibert, Evan Stein, Jonathan Grenda, Thomas Butcher, Nicolette Scerra, Jonathan Goc, Sonia Brar, Gabrielle Ailinger, Sarah Stanczyk, Isaiah Brown, Ryan Sharrow, Eric Bellanca, Andrew Jasek, Paige Kippley, Taylor Sweet and Jordan Davis. 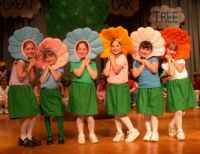 The above students are from the classes of Miss Julie Roth, Mrs. Patti Kwarciak, Miss Roseanne Russo and Mrs. Cheryl Stott. 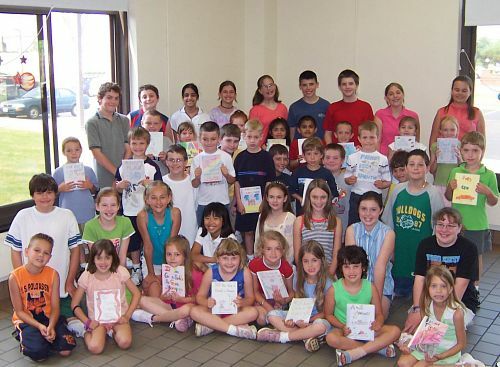 The Huth Road 5th grade classes of Miss Julie Roth, Mrs. Patti Kwarciak, Miss Roseanne Russo and Mrs. Karen Schauger delivered the books they created and illustrated for students at Sidway on Friday, June 10, 2005. Miss Roth's class presented their children's books to Mrs. Cheryl Stott's 1st grade class and Mrs. Schauger's class presented their books to Mrs. Lani Black's kindergarten class. In addition, each class made a special treat to take along and share with their new Sidway friend. The preparation of the children's books took approximately 2 months. It started with a rough draft of the story, the use of a story board (words and illustrations), transferring of the information to the actual book and the coloring of the book. 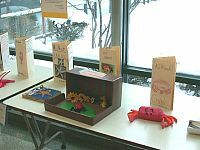 The students worked very hard to complete these books with a lot of help from Huth Road librarian Mrs. Vinnie Passanese. 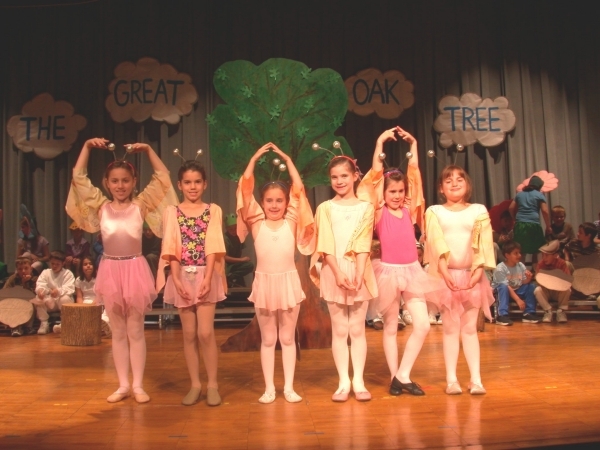 The children of Huth Road Elementary had to wait a few days to see their fellow students perform "The Great Oak Tree." A power outage Monday, May 16th postponed the play until Thursday, May 19, 2005. 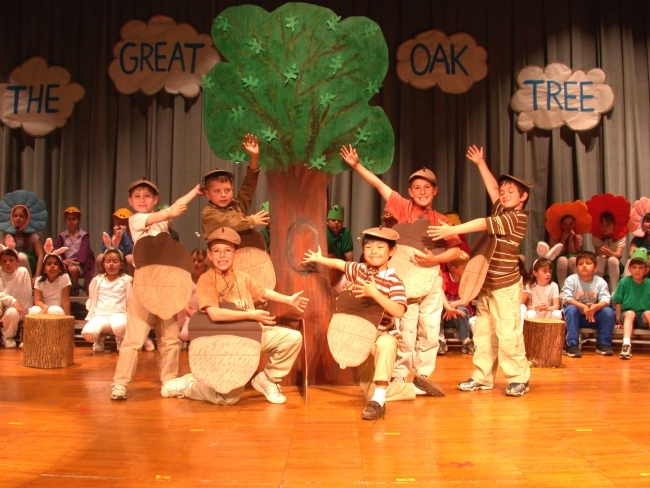 Second grade students of Mrs. Beth Boron, Mrs. Mary Kopf and Mrs. Jeanne Percival were superb singers and dancers in the story of a great big oak tree that woodcutters were instructed to chop down. 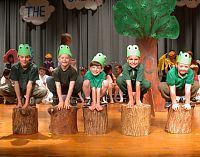 Birds, flowers, acorns, bunnies, frogs, butterflies and children entertained the woodcutters and convinced them to stop the cutting. 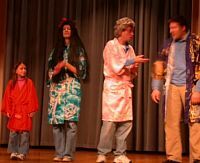 The parents of the performers were invited to see the show on Tuesday, May 17, 2005. 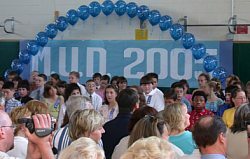 The Huth Road Elementary School was without power and phone service on Monday, May 16, 2005. Shortly after morning announcements, a fuse in the pole of the power lines to the school went out and power was interrupted. While inspecting the lines for repairs, Niagara Mohawk personnel determined that it was necessary to turn off all power to the school. During the power outage, phones were not able to receive phone calls. 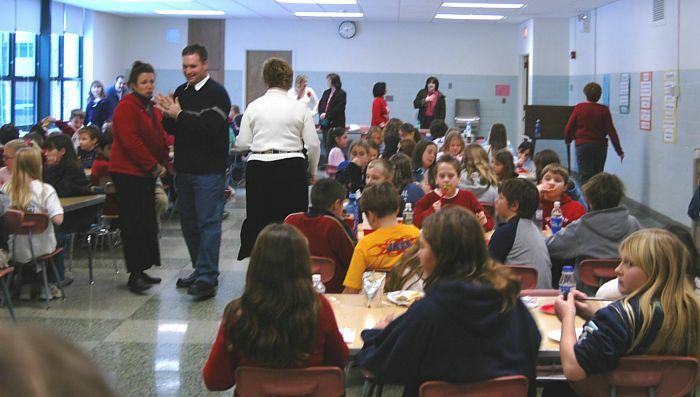 Emergency generators were used, the lights were operational and lunches were provided for the students. The problem was resolved by Monday afternoon around 4:30 p.m. 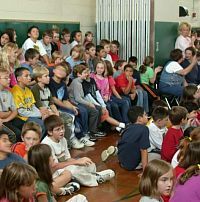 The Huth Road Elementary School is without power and phone service today, Monday, May 16, 2005. Power probably won't be restored until the end of the day. According to Schools Superintendent Dr. Thomas Ramming, this is not a safety concern; the students are doing fine. Phone calls may be made to the following: 913-8684 or switchboard 773-8100, press 0. 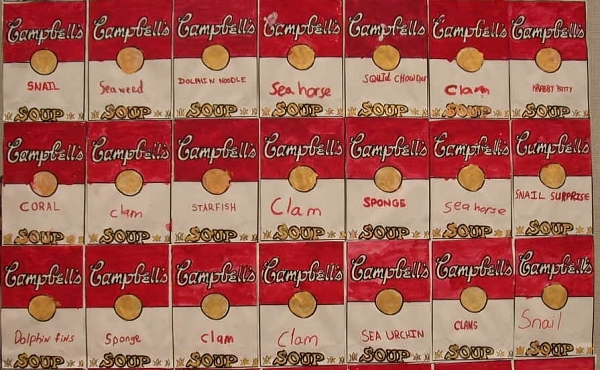 The following Huth Road students will have work in the District Art Show taking place at 6:30 p.m. Monday, May 16, 2005 in the Viking Mall located at Grand Island High School. The Huth Road Spring Choral Concert is scheduled for Thursday, May 5th at 7:30 p.m. at the Grand Island High School Auditorium. 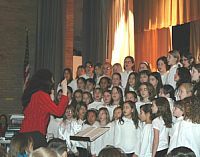 Fellow classmates of the boys and girls chorus got a sneak preview the morning of May 5th in the Huth Road Auditorium. The boys and girls chorus each sang two songs and then came together to sing a song at the end. 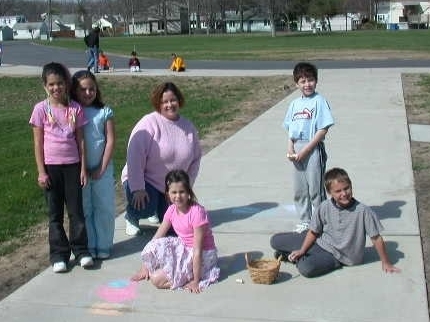 The second grade students of Mrs. Jeanne Percival enjoyed the beautiful sunny day on Earth Day 2005. They brought chalk outside and drew outlines of each other's bodies on the sidewalk and then filled them in with good ideas on how to make a better planet. Mrs. Percival said they were keeping the lights off inside the classroom for the whole day as a way to conserve energy. 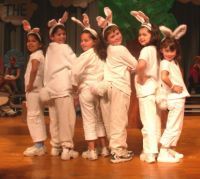 Spring pictures were taken at Huth Road School on Friday, April 8, 2005. The students shown above are from Mrs. Frances Burdzynski's third grade class. They are patiently waiting for their turn, while their fellow students to get their pictures taken. A portion of sales will be donated to the Huth Road Playground Fundraising Committee whose intent is to raise money to replace a 30-year-old portion of the playground equipment that must be removed as it is unsafe. 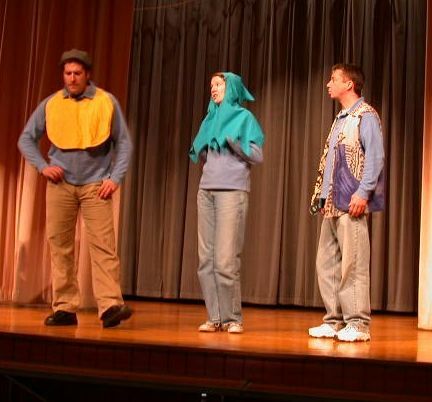 Thank You banner for teacher Robert Banks, who has coordinated the talent show for the past 15 years. 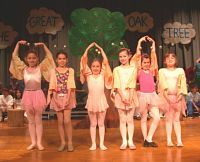 A lot of talent was on display Wednesday, March 23, as students from Huth Road Elementary School performed in the school gymnasium. The room was filled with an enthusiastic audience who viewed the hidden talents of the students, showcased at this year�s event. 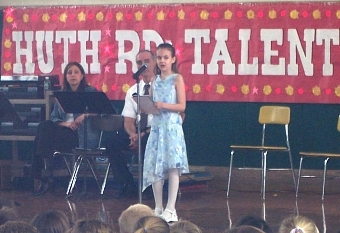 The crowd was entertained by dancers, singers, musicians and poetry reading. 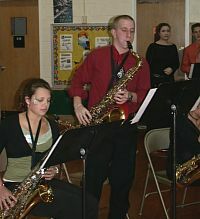 The show opened with a performance by the school�s Jazz Band under the direction of music teacher, Allan Ripley. Banners were displayed on the gymnasium walls thanking 3rd grade teacher, Robert Banks for coordinating this event for the past 15 years. Huth Road Elementary School teacher Mrs. Beth Boron and her class of second graders posed with Allison Boron, daughter of Mrs. Boron, who played the part of Lucy in the Connor Middle School play "Snoopy, The Musical." 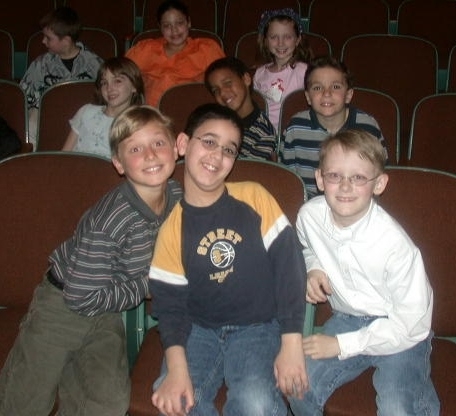 Students from Huth Road, Kaegebein and Sidway schools were treated to the performance in the high school auditorium on Monday, March 21, 2005. 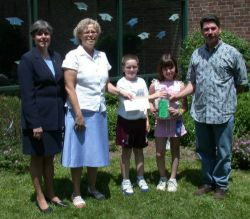 (Left) Mrs. Mary Haggarty and Mrs. Barb Swagler with student ticket pickers. (Right) Mrs. Swagler and winning teacher Mrs. Cynthia Beery. 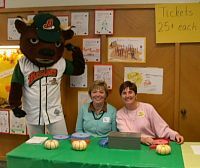 The Huth Road School Playground Fundraising Committee raised over $1,300 to help in the replacement of the 30+ year old portion of the Huth Road playground by selling raffle tickets. Prizes were generously donated by Adrian's Custard and Beef, Flower-A-Day Florist, Holiday Inn Grand Island and Firth's Jewelers. The winners, drawn on Monday, March 21, 2005, are Adam Morgan (DVD), Maria Seibert (Flower-A-Day 3-month Flower Club), Cindy Beery (Bed & Breakfast at Holiday Inn) and Joseph Gambacobta (Firth's Jewelers Mantle Clock). 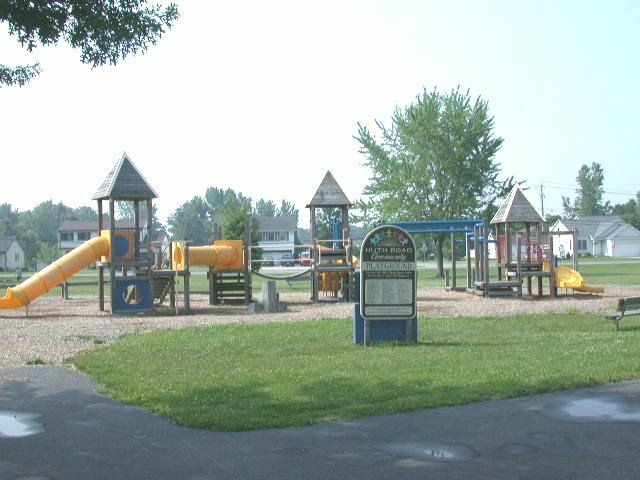 The playground committee is planning more fundraising activities during the next 12 months and looking forward to a Spring 2006 groundbreaking. 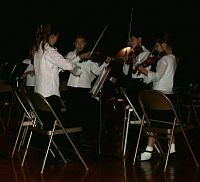 The Grand Island School District's annual Kaleidoscope Concert will be held at 3 p.m., Saturday, March 19, 2005 in the High School Auditorium, 1100 Ransom Road. 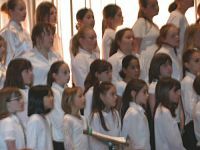 The choral concert will feature the 4th, 5th, and 6th grade students from Kaegebein Elementary, Huth Road Elementary and the Connor Middle School. 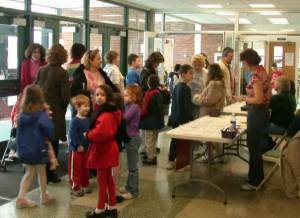 The annual Huth Road Bazaar was held on Saturday, March 12, 2005. Many students and their families turned out to enjoy the games, baked goods, face painting and raffles available. 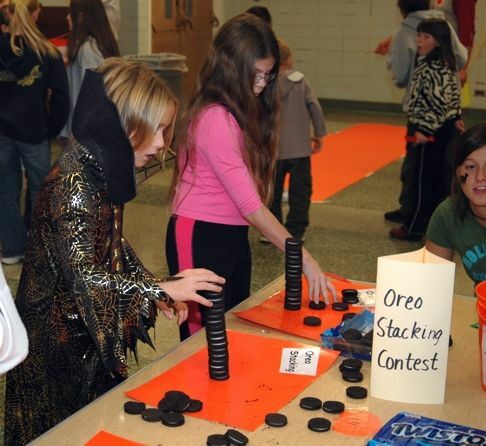 This event raises money for the PTA which is used to pay for programs throughout the year. Parents and teachers donate their time, energy and dollars to make this a successful event. 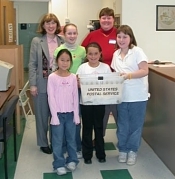 The students from Huth Road Elementary participated in a "Waves of Caring Read-A-Thon" Tuesday, February 15, 2005 to raise money for the victims of the tsunami disaster in Southeast Asia. The 4th and 5th grade Service Club, under the direction of Mrs. Deborah Beis and Mrs. Jennifer Kropidlowski, sponsored the event. The Red Cross of Western New York accepted the donation of over $5,716.79 and will distribute the funds to Southeast Asia as necessary. 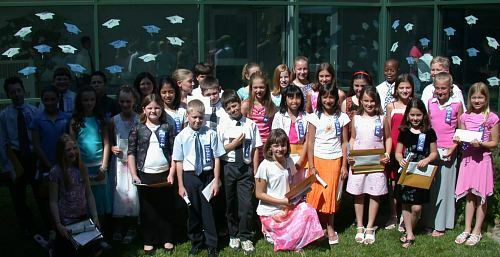 Girls and boys from Mrs. Jennifer Kropidlowski's class. 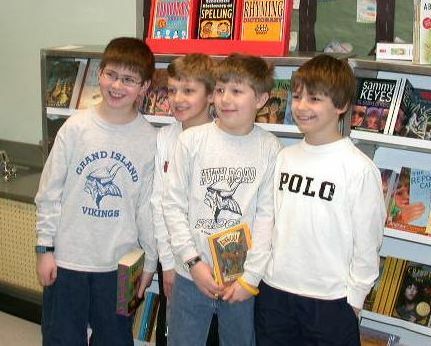 The PTA sponsored book fair came to Huth Road School the second week of February 2005. The students are especially lucky to get a buy one book, get one free deal. Each class is invited, one at a time, to purchase books at the fair or make a wish list and bring back their parents on Thursday evening, February 10, to family night. Huth Road Playground committee members will be offering raffle tickets at the Book Fair on Thursday, February 10th from 6:30-8:30 p.m. and at the Huth Road Bazaar on Saturday, March 19th from 11 a.m. to 4 p.m. In between, many volunteers will have the tickets available. Tickets are $1.00 each or a book of 6 for $5.00. Prizes are: 1st prize: Portable DVD player donated by Adrian�s Custard & Beef, 2nd prize: 3-Month Flower gift club donated by Flower a Day Florist 3rd Prize: Bed & Breakfast Package donated by Holiday Inn Grand Island, 4th Prize: Mantle clock donated by Firth�s Jewelers. Proceeds will help rebuild the thirty-year-old area of the playground that must be removed. 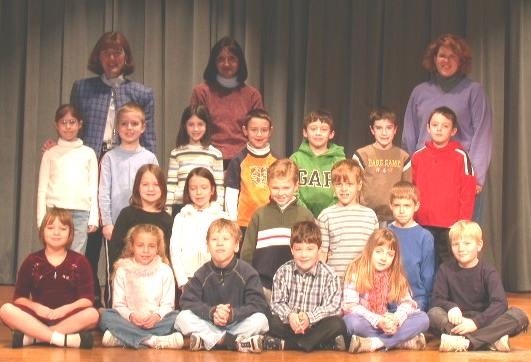 Left: Mrs. Schauger's Class; Center: Mrs. Lipp's Class; Right: Mrs. McMann's Class. The Top's Markets "Top's Tape" program is sadly discontinued but, before the program ended in December, the classes at Huth Road School helped to raise over $1,400.00 towards the new playground fund taking place this fall. 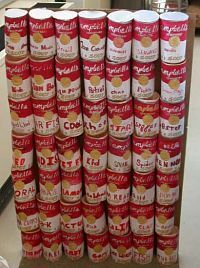 The top three classes in tape collections have been awarded an ice cream party donated in part by "Adrian's Custard & Beef." The fifth grade class of Mrs. Karen Schauger came in first place with a total of $64,000 in tapes. Diane Lipp's third grade class came in second with a total of $62,000 and Mrs. Amy McMann's second grade class was third with $50,000 in tapes. Mrs. Carol Trixier has been the chairman of the tapes program this past fall. 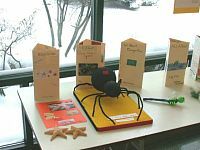 Miss Julie Roth, Miss Roseanne Russo and Mrs. Patricia Kwarciak's 5th grade class has just completed a science unit on invertebrates. Invertebrates have no backbone and include jelly fish, clams and lady bugs. 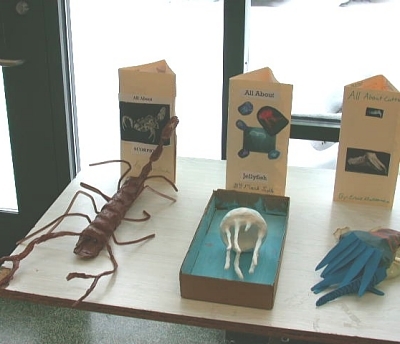 As a final project, the students made a model of the invertebrate they chose out of some very creative materials. They also designed a poster that includes some interesting facts about their chosen invertebrate. If you happen to be going to Huth Road School, take a look at the display located outside the office. Kaegebein students taking part in the "Peace Bridge" Program. The following information outlining a new elementary program has been announced by Huth Road and Kaegebein Social Worker Heather Maras and Huth Road Principal Mary Haggerty. Conflicts are inevitable in the classroom � they can be a disturbance or interference or they can present an opportunity for students to learn peaceful ways to resolve their conflicts. 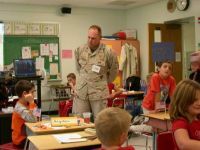 Teaching students positive ways to communicate their feelings and to work out their interpersonal problems can create a peaceful, comfortable classroom and school environment that is conducive to learning. It can also reduce the amount of time and energy spent managing classroom conflicts that take away from teaching time. At the Huth and Kaegebein Elementary School buildings, the "Becoming a Peacemaker" program was launched during the 2004 - 2005 school year. This program teaches students skills in positive communication, active listening, and creative problem-solving. The students learn the "Rules for Working it Out" and use the "Peace Bridge" to walk through steps to resolve interpersonal conflicts. 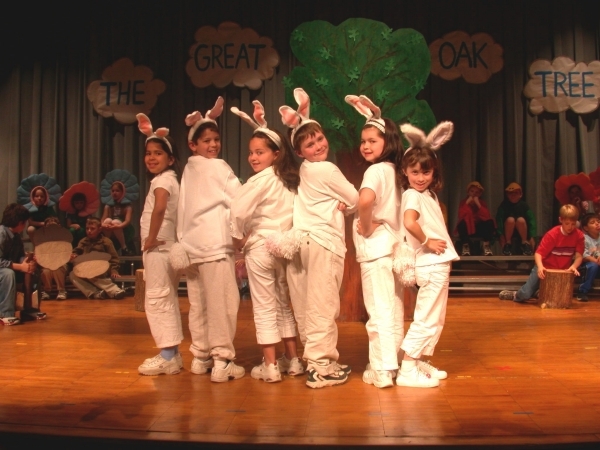 This school-wide effort is a component of the district's character education development. The program currently used by both schools is an adaptation of conflict resolution materials developed by the Grace Contrino Abrams Peace Education Foundation, Inc.
5. We are responsible for what we say and do. These rules emphasize communicating your feelings respectfully and taking responsibility for your part in the problem and the solution. The students have been or will be trained in the use of the �Peace Bridge� that will guide them step by step in the process of peaceful conflict resolution. Ultimately, the students will learn to use this strategy independently and know when they need to ask for help. 1. Grade level assemblies to introduce the Rules and The Peace Bridge including role-plays to begin to apply the model to real situations. 2. Follow-up in the classroom as a smaller group to reinforce learning and practicing use of the Rules and The Peace Bridge. 3. Other follow-up activities to practice �I-messages,� active listening skills and creative problem-solving using The Peace Bridge. 4. Posters of the Rules will be posted in every classroom and in the hallways. 5. Peace Bridge game boards will be made for each classroom and for the principal�s and social worker�s offices so students can �walk� through the steps to resolve their conflict together. With facilitation by Elementary School Social Worker Heather Maras, a grant from the Grand Island/Tonawanda Teacher�s Center was obtained to help fund this initiative. The grant will be used to cover expenses for the posters. Much success in use of the Peacemaking methods has been noted by teachers at Huth Road Elementary. In the classroom, teachers encourage students to follow the �Peace Bridge� steps in order to resolve a conflict between two students. Many teachers have commented that students have been able to come to a successful, lasting resolution to their problem using these steps. Huth Road School 5th grader, Chad Kelly, entered the national finals of the NFL Punt, Pass and Kick competition for the second time in two years. Chad won in the 8-9-year-old division in 2004, but in this year's 2005 competition in the 10-11-year-old division on Saturday, January 15, 2005 in Pittsburgh, the win wasn't to be. The son of Kevin and Charlene Kelly of Grand Island and nephew of famous football player Jim Kelly, he was one of only 32 individuals to advance to the national finals. Jodi Robinson Photo. Click photo for a larger view. Chad and his mom, Charlene Kelly with championship trophy won last year. 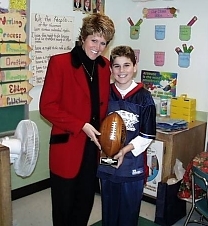 Ten-Year-Old Chad Kelly is an award winning football player who last year won the national Punt, Pass and Kick competition for his age group. He is headed back to the NFL's Pepsi PP&K finals, to be held Saturday, January 15, 2005 in Pittsburgh before the Steelers' playoff game against the New York Jets. A fifth grader at Huth Road Elementary School, he is the son of Kevin and Charlene Kelly of Grand Island and nephew of famous football player Jim Kelly. Click "B U F F A L O N E W S story" to read how Chad is following in his uncle's footsteps. 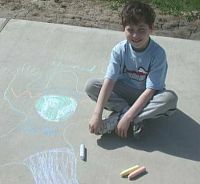 Huth Road classmates have been asked to sign a banner by the school courtyard to show the school's support for Chad. This Saturday, January 15th,has been proclaimed Chad Patrick Kelly day here in New York State. 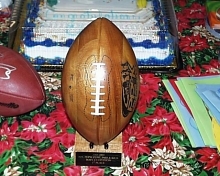 For last year's story on Chad's National "Punt, Pass and Kick" win, click "2004 Winner."